AFF (Accelerated Free Fall) is the fastest route to becoming a skydiver. You will receive an intensive course with personalised instruction throughout. 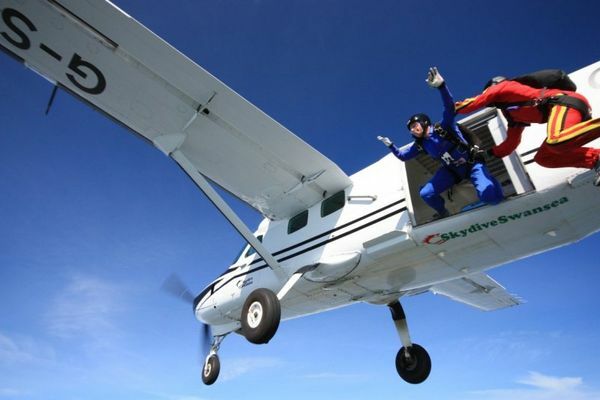 The course will teach you all of the skills needed to become a qualified skydiver. A full day’s ground-based training is required prior to jumping. This covers everything you need to know – the equipment, aircraft procedures, sequence of the skydive, free fall body position and how to deploy, control and land your parachute. 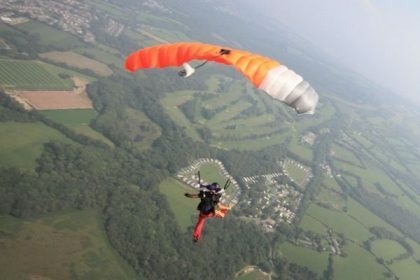 All of our instructors are fully qualified BPA (British Parachute Association) instructors with many thousands of jumps. The ethos of AFF is continuous exposure to free fall and the opportunity to correct problems dynamically through in-air instruction. The equipment used is the latest square type parachute which allows easy control and safe landings. You will also be fitted with a chest mounted radio throughout the course so that instructions can be given from the ground if required. AFF is the quick way into the world of skydiving. It gives the individual immense satisfaction and personal reward in terms of the people they meet and the experiences that only a few will ever have. A BPA AFF course is recognised throughout the UK and abroad, so once completed, an individual can jump anywhere in the world. We run 6/7 courses a year between February & October. The ground training day typically takes place on a Thursday or Friday. The arrival time is 09:00 and the training lasts till about 6pm During the training you will be thoroughly briefed on the forthcoming AFF course, including being able to maintain a stable position during free fall, how to deploy and control your parachute, and how to adopt a safe position for landing. The training is a mix of theory as well as practical exercises and so we suggest you wear comfortable clothes and trainers. There is no jumping on the training day.£195 deposit is required to book a course. By filling in the enquiry form below we will email you further details and the booking form. After the ground based training day weather permitting, we aim to do the AFF Tandem and the AFF Level 1 skydive over the coming weekend. 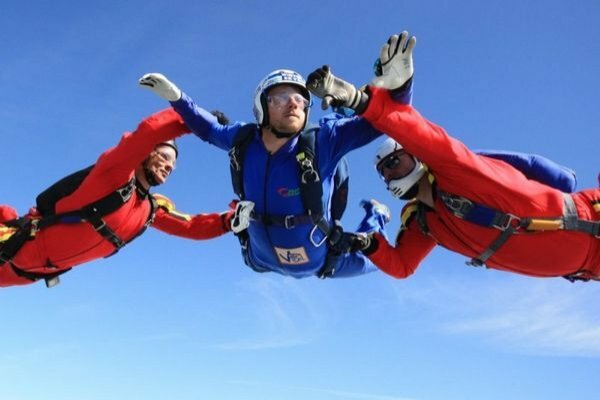 Doing an AFF tandem we find greatly increases confidence ahead of the Level 1 skydive itself. This AFF Tandem will be from approximately 12,000 feet. You will be wearing an altimeter and the instructor will give you an orientation of the airfield whilst under the parachute. With the dual controls you can steer the canopy under the guidance of your instructor. Your instructor will land the parachute for you. 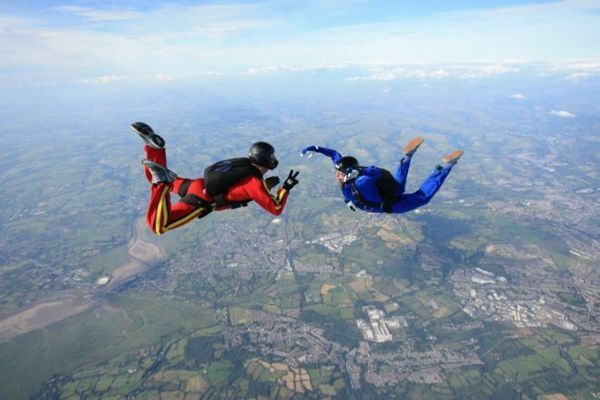 For your AFF Level 1 skydive, you will have an instructor either side of you in free fall. Instructions will be given via a set of hand signals which relate to control/ movement of different parts of your body. You will be wearing an altimeter and a chest mounted radio so instructions can be given to you from the ground to help you land the parachute. You can expect a thorough briefing prior to the jump and a full debriefing after landing. On level 1 you will be observed by the instructors for awareness, altitude checks and practise pulls. 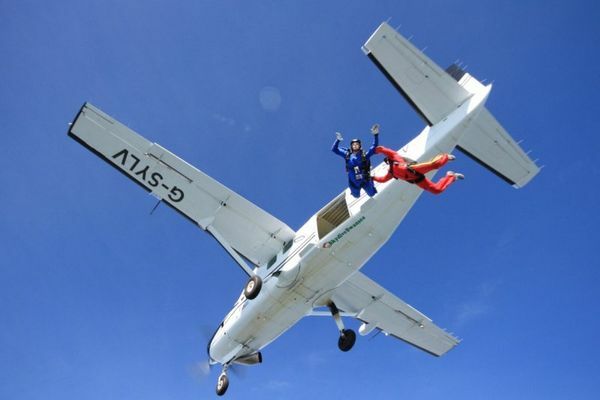 Some people just wish to complete the AFF tandem & AFF level 1 skydive. For those that wish to continue the course we offer a pay as you jump option. Please note if you do not pass a jump you will have to repeat it and pay for the jump again. If you have to repeat Level 1 this would be £184. If you wish to do an AFF course we ask that you can commit at least 3/4 days a month at the centre to try to jump. After your initial training day you are valid for 3 months to jump. Each time you come to the centre to jump you will be required to be there at a set time normally by 8.30am on a weekend to do a mini refresher training session that we call drills. Each time you do your drills your training is validated for 3 months again. If for some reason you didn’t do your drills for 3 months or more you would of expired your training and wouldn’t be allowed to jump until you had completed another full training day. We have two landing areas at the Airport called Southern and Northern. Which one we land on is dictated by the wind direction. AFF students are only allowed to jump when we are landing on the Northern area. Every day is different with the wind. It can sometimes mean we spend all day on one landing area or the other or even change throughout the day. The more you are at the centre the more chance of you jumping. Level 2 £184 – You will be briefed by your instructor again, and will practise the skydive on the ground before entering the plane. You exit the aircraft at 12,000 with two instructors again. This time, you learn to control movement whilst maintaining heading and altitude awareness. At 6,000 feet you signal to your instructors and deploy your parachute. Once again, an instructor will guide you via radio to help you land. A debrief will follow the landing. Level 3 £184 – As with the previous levels, you will receive a thorough briefing on the ground first. You will have two instructors again and will maintain a heading whilst demonstrating control in free fall. If you are doing well then the instructors will release you. You still need to maintain heading and altitude awareness. Once again, an instructor will guide you via radio to help you land. Another debrief will follow the landing. Level 4 £111 – Thanks to the skills that you have demonstrated during the previous levels, you now only require one instructor. You learn to start, control and stop turns whilst in free fall. Level 5 £111 – One instructor again. This time you will execute controlled 360 degree turns in front of your instructor, all the while maintaining altitude awareness. Level 6 £111 – One instructor, but more advanced techniques now. These include spatial orientation, a back loop (or somersault) and moving forward horizontally (or tracking) through the air. Level 7 £111 – One instructor. On this level, you will put into practice everything that you have learnt so far! After exiting the aircraft from 12,000 feet you are required to complete a set sequence of 2×360 degree turns, a back loop (or somersault), and a short track before deploying your parachute at 5,000 feet. Level 8 £38 – The last level! You leave the aircraft on your own at 6,000 feet. You will maintain stability and deploy your parachute within 10 seconds. All these jumps include instruction, de briefs, kit hire and packing of the parachute. Please note if you do not pass a jump you will have to repeat it and pay for the jump again. Once you have finished your AFF tandems & AFF levels 1 to 8 it is necessary for you to complete a further 10 jumps known as consolidation jumps (consols). During this period you will still be checked and dispatched from the aircraft by an instructor. You will practise your skills and improve on what you were taught during the the AFF levels. Consols are £38 each and include instruction, de briefs, kit hire and packing of the parachute. After you have completed these 10 consolidation jumps you will be able to receive your BPA “A” licence. This is recognised at all parachute centres in the UK and internationally. If you are interested in booking this course please fill in the details on the enquiry form and we will email you further details. If you have completed a tandem skydive with us previously then you would have been issued with a “P6” number. This is your 3rd party insurance number, and is valid for a year. It allows you to do as many tandems as you like within that 12 months. It will also cover you for your AFF tandem and your AFF Level 1 skydive. If you do not have a “P6” insurance number then we will issue you with one. This will cover you for your AFF tandem and your AFF Level 1 – the cost is included in the cost of the training. This 3rd party insurance covers you for up to 5 million pounds. If you wish to continue onto AFF Level 2 then you are required to convert this insurance to full BPA membership. The membership year runs from the 1st April each year, and expires at the end of March. Therefore the cost of the conversion depends on when you take it out. Please bring a credit card with you so that you can complete the application form when needed. Our governing body, the British Parachute Association (BPA) will send you a membership card which you should keep with you. You will also receive a magazine every 2 months from the BPA. 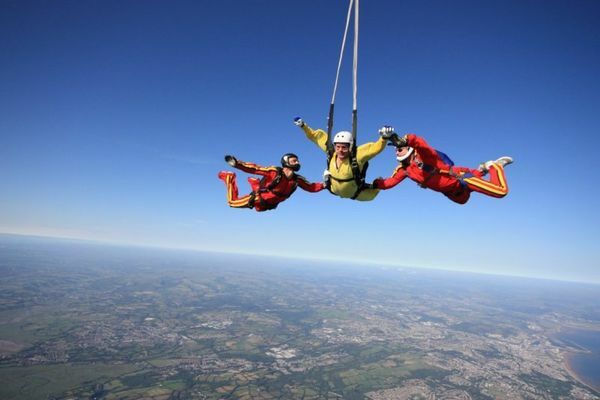 Some people do like to have personal insurance cover which covers skydiving. There are various companies which offer this type of cover so it is best to search the internet to find one which meets your needs. If you did every jump perfect with full BPA 3rd party insurance the cost would be around £1825. 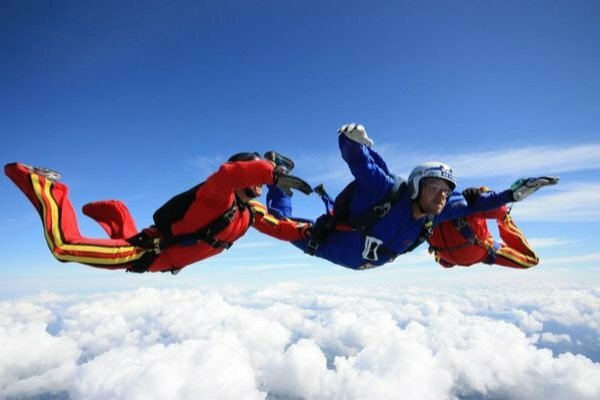 £38 up to 12000 feet including kit hire and packing. If you have your own equipment and can pack the cost of a jump would be £23. Safety is the number one priority throughout the course. As a student there are restrictions on the conditions you may jump in – so patience is required in abundance! The weather plays a huge part so please understand that it may take some time before the jumps are completed. It can be very frustrating as a student – all of the instructors have been in the same position themselves and understand your situation fully. We have two landing areas at the airport. Which one we land on is dictated by the wind direction. AFF students are only allowed to land on the Northern area. This means that you may be unable to jump if the wind is not in the right direction. Unfortunately we cannot guarantee the weather and so there may be days where you are at the centre all day yet can’t jump. If you can commit weekends to the centre and the weather is good, then we can hopefully get you through as quickly as possible. Click here to view useful documents. Make sure you have read and understood which forms are required and that the correct procedures are followed before filling them out. You do not need to be an Olympic athlete to become a skydiver but there are limitations as regards to your weight – 15 stone for men and 13 stone for ladies (both fully clothed). EVERYONE has to fill out a Solo Student Medical Form. There are two Medical Forms. 115C and 115D. You may require a doctor to stamp and sign one of these forms. Our governing body, the BPA, does not allow anyone aged 55 or over to do AFF training unless you have had previous recorded solo experience on ram-air parachutes. Visit our documents page to read the Medical forms to see which one you need to fill out and to download copies of these forms from our website. Add your details to the Enquiry Form below and we will email you an information pack, medical form and dates available on courses. Please check your spam/junk folder in case it ends up in there. We cannot take bookings over the phone. A deposit of £195, completed medical form and booking form is required to secure a space on a course and the email will explain how to pay.